During the Mahabharat war, Arjun's son, Abhimanyu entered the Chakravyuha formation easily, but he did not know how to come out, resulting in his unfortunate death. Similarly, the Chennai students and the youth who started the spontaneous pro-Jallikattu protest on 17th January 2017 could not conclude the protest even after victory, resulting in chaos and police action. Jallikattu, one of the traditional sports of Tamil Nadu, was banned in 2014 by a Supreme Court order citing cruelty to the animal, the bull. Since the final verdict of the Supreme Court has not been delivered yet, every year, Jallikattu lovers used to express their protest in order to pressurise the Central and State Governments to resume the sport. With the strong political leadership in the state, these protests used to be nipped in the bud. Although Jallikattu were normally conducted only in a few places in the state of Tamil Nadu, over the span of the last few years, it has been taken up as one of the symbols of Tamil tradition. On the other hand, animal welfare activists have been protesting against Jallikattu on the grounds of animal cruelty and they obtained the stay from the Supreme Court in 2014. 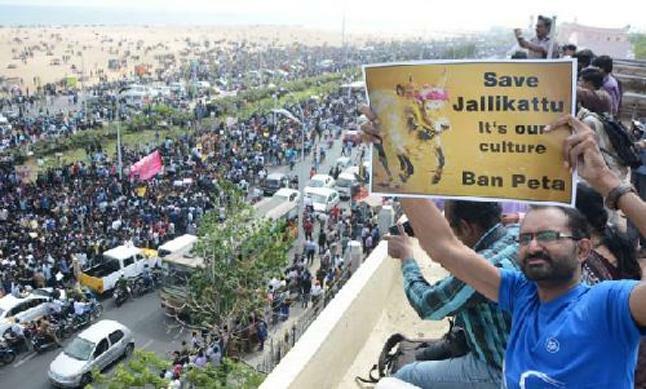 Immediately after the Pongal / Makara Sankaranthi holidays, a group of less than 100 social activists assembled at the world famous Chennai Marina beach on 17th January 2017 to register their pro-Jallikattu protest. The same morning, another small group of protesters assembled at Alanganallur, a small village near Madurai where the popular Jallikattu used to be held every year. Both these events were telecast live on 17th January by one of the Tamil TV channels, obviously to improve their TRP rating. Taking a cue from this channel, other leading Tamil TV channels joined to telecasting live the voice bytes of the protesters. Meanwhile, messages from the students and the youth were flashed via WhatsApp and other social media. Since it was a holiday on account of Pongal / Sankaranthi, thousands of students and youngsters gathered at the Marina beach to join the protest. By evening, more than one lakh (100,000) people gathered in the 5-kilometre stretch of the beach. At this stage, the crowd became too large for the police to control or even disburse it. Instead the Government itself seemed to support the protesters from the background in order to pressurise the Central Government to approve the Ordinance reinstating Jallikattu. The police force was also empathetic towards the protesters. The students and the youth stayed overnight on the beach, and were efficiently managing the large gathering. With many more TV channels and other traditional media joining in, with thier live telecast, more people joined the protest the following day. Traders joined in the protest with a Bandh (strike) in support of this protest. The 'Marina protest' gathered momentum with the presence of nearly two lakh (200,000) people at any time at the beach and a floating population of around 3-4 lakh. This pro-Jallikattu protest spread to other parts of Tamil Nadu with thousands of students participating simultaneously in various localities of the state. Although the protest was started on a low scale by a few activists, after the second day, it became a 'People's Movement' and national TV channels joined in the live telecast. The event became an unprecedented and unexpected situation for all. On the fourth day of protest, the Tamil Nadu Chief Minister met the Prime Minister and obtained an assurance from him that the Central Government would provide support to the State to conduct Jallikattu peacefully. As suggested by the Prime Minister, an ordinance was prepared, verified by the various ministries at the Centre and was issued by the Governor with the prior approval of the President of India within 24 hours of the initial meeting with the Prime Minister. It is pertinent to mention that during their protest, the student protesters did not allow any political leaders to hijack the protest. There were hundreds of independent groups at the beach. Some 'invisible' hands/anonymous sponsors provided breakfast, lunch, dinner and snacks to the protesters throughout the day. Soon, people streamed onto the beach with their families. "It became more of a celebration than a protest", observed one of the parents who visited the beach with his children. By the third day of the protest, some anti-national elements joined the protest, hijacking it from the genuine student protesters. They began shouting anti-national slogans and displayed banners demanding independence of Tamil Nadu, and declaring the Republic Day as 'Black Day'. Genuine students who brought national flags were prevented from displaying them. Several alert observers warned about these trouble shooters on the social media, but the anti-national elements could not be removed from the Marina, as the entire crowd was by then, emotionally charged. The situation became volatile. Thousands of the genuine students and youth protesters stayed on at the pro-Jallikattu protest. Since there was no singular leadership for the movement, the subject for demand and protest changed daily without rhyme or reason, from the original 'pro-Jallikattu' to other unrelated issues for protest. This probably became a rare incident when India faced a protest, not headed by a leader. Since it was an emotive atmosphere, the police too soft pedalled the situation and handled the surging crowd leniently. Instances were reported of some police constables in uniform, delivering political speeches that criticised the Government. The Government did not take cognizance of this impending risk and take punitive action against these police officials. On the fifth day, viz. on 21st January, the Governor issued an ordinance permitting the people to conduct Jallikattu. The Chief Minister himself went to Madurai to inaugurate the Jallikattu event. The Chief Minister and some elders requested the students and the youth to give up the protest and celebrate the moral victory, as both the Centre and the State had resolved the issue. At this stage, some of the anti-social and anti-national organisations instigated the protesters, persuading them to not give up the protest. Their motive was to continue the protest till the Republic Day on 26th January, and then to disrupt the celebrations. Sensing this imminent trouble, the police began negotiating with the students to withdraw the protest and return home. Even the Chief Minister, who went to Madurai to inaugurate the Jallikattu, had to return without doing so, as some vested groups did not allow him. These protesters by then modified their demand to one for a 'permanent solution' in spite of the fact that the Government had assured them that the ordinance would be enacted as law in the State Assembly scheduled to meet on 23rd January. Unfortunately, the television media held emotive reports and debates provoked in order to increase their TRP ratings, instead of educating the people about the significance of the ordinance and the law. With the protesters' showing no intention of coming to an amicable conclusion to end the protest and vacate the Marina for the Republic Day parade, on 23rd January morning, hundreds of the police in uniform without any lathis or arms, entered the Marina and requested them to vacate. Senior Police Officers even appealed through public address systems. Many students, in response, left the beach. However, some mischief-making groups provoked some of the students to stay back. These ignorant students stayed back, and began moving towards the sea, threatening to commit suicide (picture on the right). It is commendable that the Police dealt with this precarious situation with deftness, maintaining a soft approach by just requesting them to vacate. The protesters then began spreading rumours that the police force was attacking them, through WhatsApp and other social media. The TV media aired this allegation without proper verification. As a result, violence broke out in several parts of the city. Vehicles were burnt and the police had to deal with the anti-social elements in a tough manner in various parts of the city. The police finally managed to vacate the beach of the protestors by the night of 23rd January. Hundreds of anti-social elements were arrested. Meanwhile, the ordinance was made law on 23rd January by the State Assembly. The Chief Minister that day also displayed the photographs of anti-national posters that were put up at the beach, in the Assembly. What is Unique About this Protest? Lakhs of people had gathered at the Marina beach and in other parts of the state, provoked by the news that were circulated in the social media, especially the Television and WhatsApp. The protesters had initially conducted themselves well at the beach and they took care to maintain the traffic conduct and the cleanliness of the place. Hundreds of social groups and NGOs had participated in the protests without causing any inconvenience to the people, until on the fifth day when the anti-social elements took over. Since it was a 'leaderless' protest, many anti-national and anti-social elements sneaked into the venue and displayed anti-national posters. They also displayed vulgar posters about the Chief Minister and the Prime Minister. Many long-forgotten film personalities and 'fly-by-night' political party leaders entered the foray to take advantage of the live TV coverage. Neither the genuine protesters nor the police could control the bedlam. The police failed to take action against the constable who had delivered an inflammatory speech against the Government. Such adverse emotions expressed by law enforcement forces like the police and the military, is certainly a dangerous trend. Any well-meaning moderate who attempted to diffuse the situation was branded 'Anti-Tamils'. Even the leaders who were fighting for Jallikattu in the Supreme Court for more than a decade were abused when they requested the students to end the protest after the Government had enacted the law. When there are many other issues like agriculture, water supply, drought and education that are more critical, affecting the common man, the protesters opting for 'Jallikattu', which is conducted only in a few places by some select communities, was under criticism. But nobody dared raise his voice for fear of being branded 'Anti Tamil' and attacked. PreSense places on record its recognition and appreciation of the utmost restraint shown by the Chennai Police and particularly the Dy. Commissioner of Police, Shri Balakrishnan, who supervised the management of the emotionally charged crowd for 7 days. There are also allegations of the police having set some vehicles ablaze. Although these allegations are being investigated, we should not ignore or hide the fact that the initial peaceful protest by the youth was maligned by anti-national elements with mischievous intentions. In a democratic country, any protest is legal. The protesters should know when to start a protest, how to manage it, and when to end it. Prolonging a protest unreasonably can have disastrous consequences. Even though the students won their cause, they could not enjoy the success due to their lack of clarity of purpose, and wrong guidance from miscreants. They yielded to 'emotion' and not to 'reason'. Whenever such people's movement happens in future, the police personnel should restrain their personal inclination, especially when in uniform. Thos officials who displayed inappropriate professional behaviour should be dismissed from service, as they could be a threat to the reputation of the entire force. The television media and other social media played a very dangerous game by spreading false information and rumours. Even the debates on all the regional channels at the critical time did not focus on finding solution, but focused on the emotional issues. Violence broke out due to wrong and provocative messages that circulated among the people. It is strongly opined that if TV channels do not conduct themselves in a responsible manner in future, their licenses should be immediately and irrevocably cancelled. If the social media is used to infuriate and instigate, the internet facility should be temporarily disconnected to arrest the spreading of the rumours. Safety of the nation and its citizens is more important than the 'freedom of expression'.